The Festival of Insignificance (translated by Linda Asher, review copy courtesy of Australian distributor Allen & Unwin) is a novella set in Paris, a book which follows a group of men as they go about their comfortable, casual, mostly-bourgeois lives. Alain, Charles, Ramon, Caliban and D’Ardelo go to parties, flirt with attractive women and, when they have a moment, reflect on their rapidly receding youth. 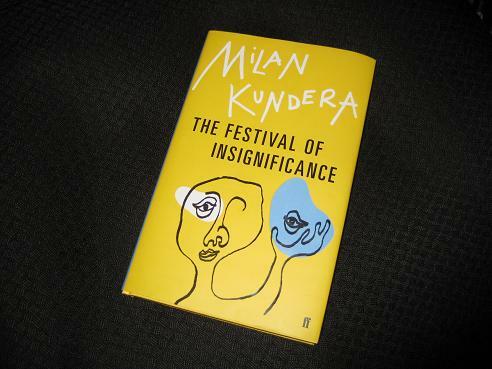 The Festival of Insignificance joins a long list of Kundera’s mid- to late-career books in its foregrounding of an abstract concept, insignificance being added to traits such as slowness, ignorance and immortality. Much of the story concerns the men portrayed here coming to grips with the prospect of their own insignificance. They might be important in their own social circles, but elsewhere their time has gone, leaving them to fill their time with matters insignificant and inconsequential. The figure of the great seducer Quaquelique, a wallpaper Don Juan, is the book’s primary example of the power of fading into the background, but the novel is full of life’s little insignificances. From the beginning, the focus of the novel is on the micro, with the first section entitled ‘Alain Meditates on the Navel’. It takes a bold writer to engage with the concept of navel gazing on the first page, especially when many readers (and critics) might already be thinking in that direction. There is a wider significance, though, to the idea as the writer, and his characters, ponder the navel as the source of humanity, the invisible thread linking us all back to Eve (the woman without a navel…). Good review! I’ve been wanting to read something by him. Guess I should start with The Unbearable Lightness of Being? How about if you read Unbearable and loved it and want more like that? Aaah, shame, I was looking forward to this – was reading him with real passion in the early 1990s. Ah, you’ve summed up my feelings about Kundera’s late work as compared to his earliest masterpieces. I feel it’s unfair for readers to compare, or to insist on a certain level of quality or focus on particular themes a writer may have written about early on in their careers. But I do wonder whether Kundera’s switch from writing in French has anything to do with his “lackluster” novels. Still, most books would suffer from a comparison with The Unbearable Lightness of Being or The Joke.